The DeKalb County Department of Watershed Management (DWM), established in 1942, services over 5,000 miles of water and wastewater pipes in the county system of Georgia. The DWM maintains and operates several major facilities throughout the county in an effort to protect the public health, safety and welfare throughout the community. 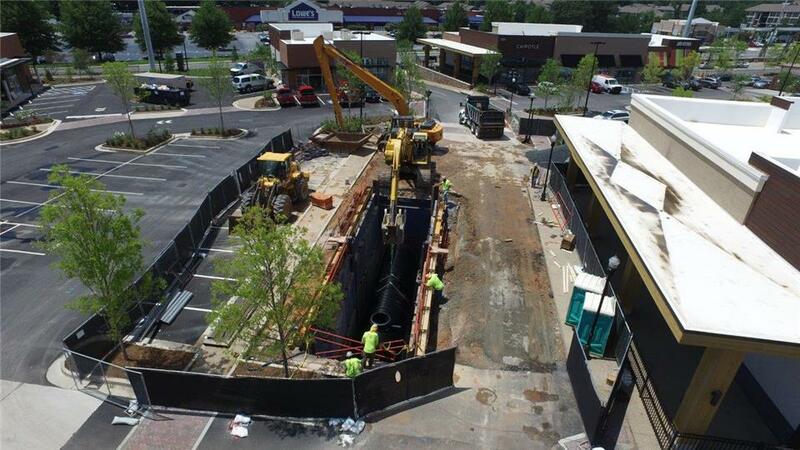 In response to the development of the Peachtree Station Shopping Center in Chamblee, Georgia, the DWM proposed the Sewer Action Plan to address the limited sanitary sewer capacity in that specific area. This proposal provided a viable solution to the downstream sanitary sewer capacity issues in the DeKalb County system in order to allow the construction of the proposed Peachtree Station shopping center. The existing downstream sewer system lacked the adequate sewer capacity during rainfall events. 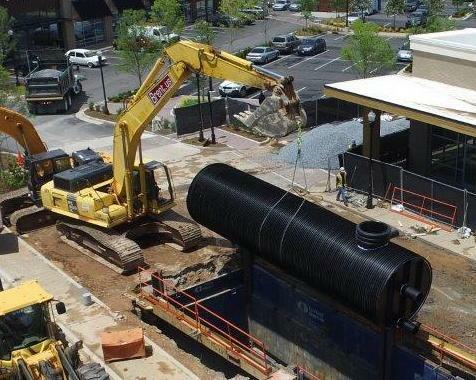 The proposed sewer action plan included the construction of sewer holding tanks within the Peachtree Station shopping center project area to store the sewerage flow from the retail and commercial buildings during rainfall events which would then be released after the rainfall event had ended and during off-peak hours. The property, located on over 11 acres, originally consisted of several miscellaneous retail buildings which were demolished in order to make way for the property enhancements including the new 106,864 square foot, retail shopping center. The sanitary sewer overflow system, once released, would flow into the existing public sewer line along the Peachtree Road right-of-way to match the flow path from the previous buildings on the site. The engineer considered several options, including concrete vaults and fiberglass tanks. Ultimately, a DuroMaxx® steel reinforced PE (SRPE) tank manufactured by Contech Engineered Solutions was selected to contain the sanitary sewer overflow. DuroMaxx provided many benefits over other options considered, including fast installation, lower expense, smaller footprint, watertight construction, excellent durability and lightweight material. Utilizing a DuroMaxx CSO tank provided a cost-effective solution that saved time over the other storage options as it could be delivered quickly as a complete unit and installed with minimal effort. This was an important factor as the project was nearly completed with the exception of the Sewer Action Plan. The site developer wanted to expedite the project into final completion and obtain their certificate of occupancy from the county quickly as most of the project had already been completed. The fast delivery, easy and straightforward installation, and cost-effective attributes of the DuroMaxx SRPE made it ideal in this situation. In the end, Contech reduced the cost of the system to meet financial requirements, provided a reliable system with ease of installation, and supported the contractors throughout the entire installation process.